Happy November!!! Wow can you believe that Thanksgiving and Christmas are right around the corner??? Are you thinking about gifts for your staff or customers? Nov 1 - 10, 2010, Devon & Jones and Harriton Fleece. Men's and Women's full zip jackets and Unisex fleece vests are on sale. What a great way to say thank you to your hard working Staff and Loyal customers than to give them a gift that will help keep them warm in the winter months to come. Best of yet once again there are no order Minimums!!! You can't beat that! To view the colors available for each style please go to www.4logowearables.com. If you have any questions about any of the products, please call, e-mail or stop by. Spooky Savings on select Champion Sweatshirts. 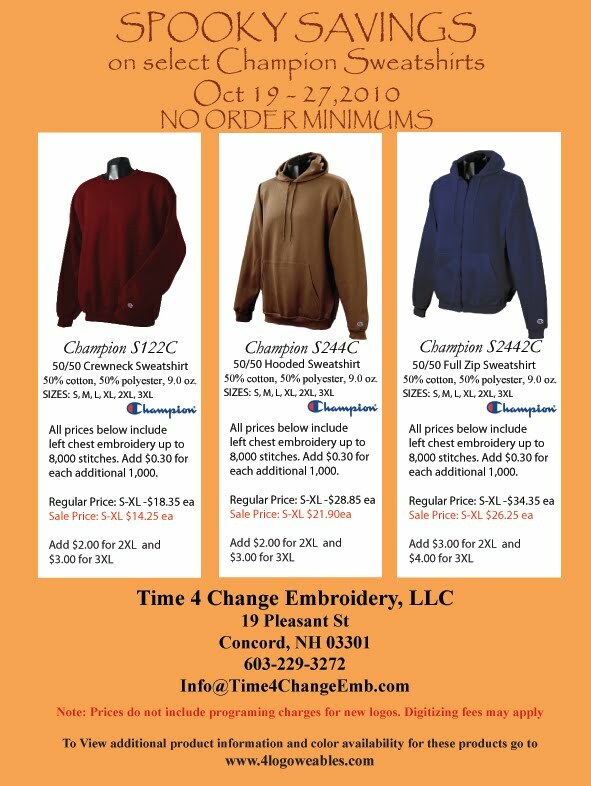 Prices include left chest embroidery up to 8,000 stitches. And best of all, NO ORDER MINIMUMS. Read flier for additional information. (Click on image to view larger version). 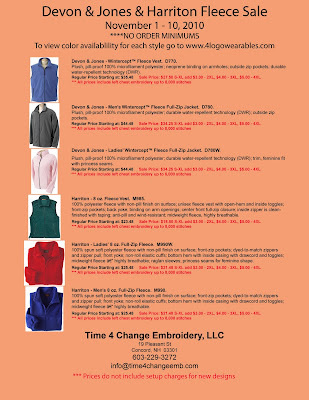 Have any questions e-mail info@Time4ChangeEmb.com, call or stop on by the store.